Note: This story was updated on Friday, Oct. 29 at 5:05 p.m.
Harry Horinouchi, the Consul General of Japan in Los Angeles, met yesterday morning with representatives from the Ad Hoc Committee to Save Keiro. The committee requested the meeting in order to explain to Horinouchi its reasons for opposing Keiro’s sale of its facilities and to ask him to write a letter to Attorney General Kamala Harris requesting that the sale be postponed for a public hearing. 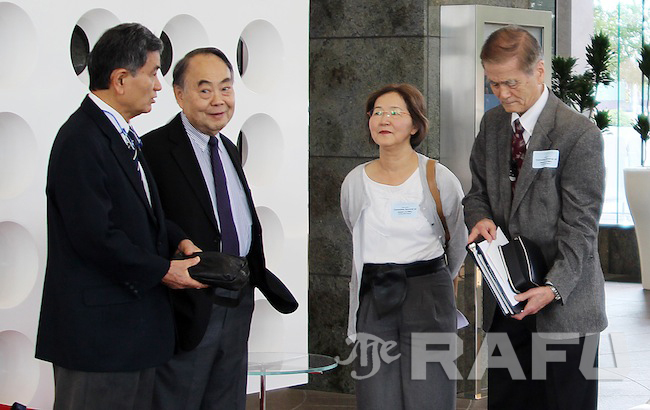 The four committee members present at the meeting were Toshio “Terry” Handa, Dr. Charles Igawa, Dr. Keiko Ikeda, and Dr. Kenji Irie. According to Irie, Horinouchi was already familiar with the situation, having heard about it from Keiro’s perspective at various community events. Irie felt that the consul general met with the Ad Hoc Committee out of a sense of fairness and desire to hear all sides of the story. Horinouchi also mentioned that he wondered why it took so long for community protesters to begin organizing. The responsibility of the consulate is to protect Japanese citizens living abroad, through handling visas and passports; reporting events like births, deaths, and marriages; intervening in case of emergency; and facilitating communication between the U.S. and Japan. Irie and other members of the Ad Hoc Committee believe that, because Keiro was established with the help of Japanese businesses and government officials, and because many of its residents are Japanese citizens who will be put “at risk” by the sale of Keiro’s facilities, this issue falls under the consulate’s jurisdiction. However, because the consulate has a limited role, it is uncertain whether it will be able to involve itself in this matter. It is difficult to determine the number of Keiro residents who hold Japanese citizenship. A few residents of the retirement home have said that as many as 80% are Shin-Issei or Kibei who speak primarily Japanese. A representative from Keiro said that percentage is closer to 60 and did not know how many of those were Japanese citizens. According to Irie’s research, 40 out of 260 residents, or about 15%, at the Keiro Nursing Home in Lincoln Heights maintain Japanese citizenship, and he estimates that percentage to be consistent across all four of Keiro’s facilities. Irie himself is a Shin-Issei. “I told [Horinouchi] that I may also be admitted to Keiro in the future,” he said, “so I would like him to issue me an inochi no visa,” or a visa for life. After the meeting, Consul Kazutoshi Hayashi, who was also present at the meeting, told The Rafu Shimpo that his office had met with the Ad Hoc Committee and listened to its concerns. However, he said that the consulate did not yet feel it was appropriate to make a statement at this time. The Ad Hoc Committee continues to collect petitions, both in hard copy and on its website (English | Japanese). As of today, they had gathered more than 4,000 signatures for their petition to the attorney general and more than 3,000 for their petition to Keiro.